Disclosure: The Hot Springs tourism office provided complimentary admission to Mammoth Site of Hot Springs for me and my family. All opinions and thoughts expressed here are my own. I’ve never had more than a passing interest in dinosaurs and prehistoric creatures. But ever since I read about Hudson-Meng Bison Kill site in Nebraska, my interest was piqued on major archeological digs in the Midwest. 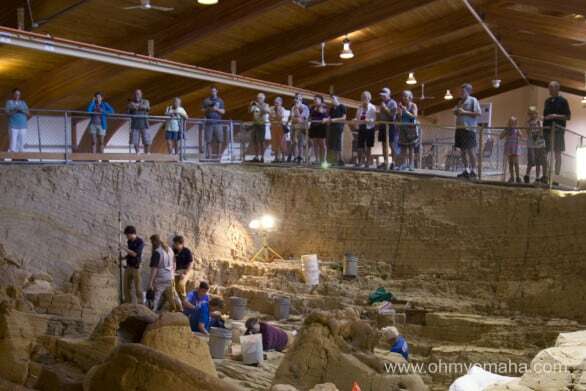 What would it be like to see a massive dig site in person? 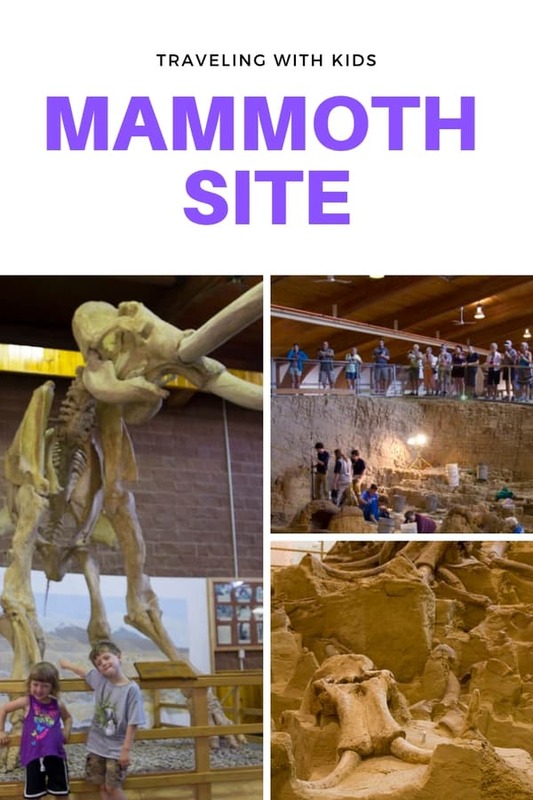 The question leads to why I wanted to include a stop at Mammoth Site in Hot Springs during our South Dakota road trip. The answer: You’ll be impressed by the experience. 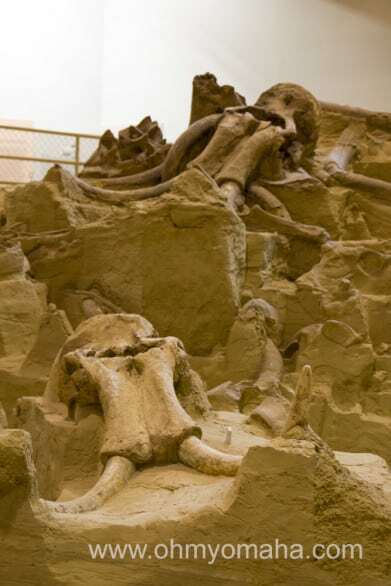 The number of bones uncovered at Mammoth Site is impressive. 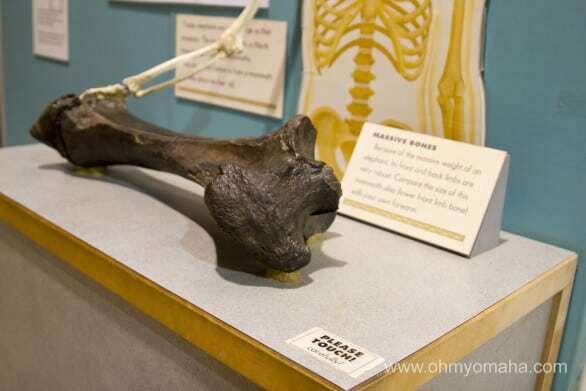 More than 60 Columbian and woolly mammoths have been identified there, as well as a number surprising (to me) fossils of camels, llamas and giant short-faced bears, to name just a couple here. Let’s all breathe a sigh of relief: It’s in a climate-controlled building (AKA air-conditioned). 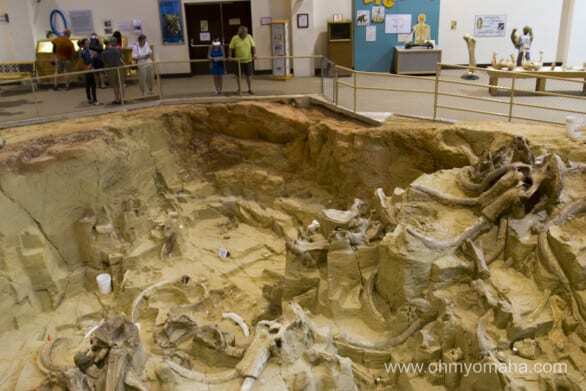 A partial view of the excavation area at Mammoth Site in Hot Springs, South Dakota. You’ll want to take a tour, which includes a short film in the beginning and a guided walk around the “in-situ” exhibit (fancy talk for bones being on display as they were discovered). You get headphones to wear so you can hear your guide. My 3-year-old hated them with a passion. Photography is allowed, but you’re encouraged to wait until after the tour so that you don’t miss whatever the guide is showing next. It’s so tempting, though, to want to snap photos in the moment. 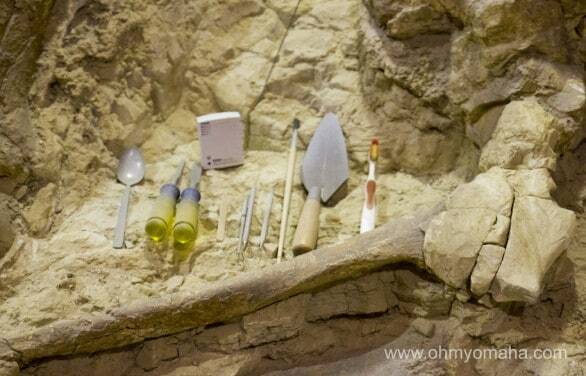 Tools used at Mammoth Site to uncover bones. After the tour, you’re free to roam, then proceed to the next door. 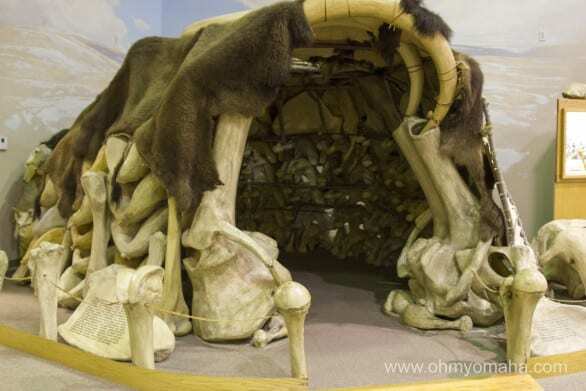 It’s full of interesting replicas, including a mammoth model and a walk-in mammoth bone hut. There’s a gift shop full of books, stuffed animals and apparel. A replica of a hut made out of mammoth bones in Muller Exhibit Hall. We lucked out and saw Mammoth Site Excavation Committee members at work during our visit. However, the people who timed their visit about 30 minutes after us missed them during their lunch break. Time your visit around the noon hour. It’s pretty fascinating to watch the work being done at Mammoth Site. There picnic tables for lunch time, if you packed accordingly. The tables aren’t far from an outdoor work site. Near the picnic tables is a work space for the volunteers to sift through dirt to find tiny fossils. You might luck out and catch someone at work. Near Mammoth Site is the restaurant Woolly’s Western Grill. It’s a kid-friendly place to get a bite to eat. How did these two do at an active dig site? My kids are 3 and 5, so not exactly at the grade levels that have been studying any of this in school. That said, they’ve at least read “Magic Treehouse” books and know a thing or two about woolly Mammoths and other prehistoric creatures, so they’ve got that going. 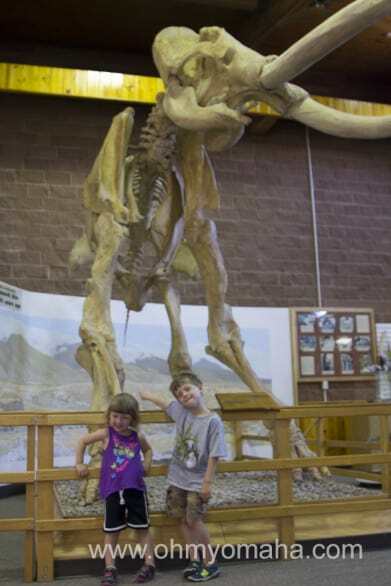 There are items on display at Mammoth Site that encourage visitors to touch, which appeals to kids. My 3-year-old daughter, Mooch, lost interest early on in the tour; our 5-year-old fared better. The tour guide provides a lot of facts, but there’s very little hands-on things to keep the truly young interested. 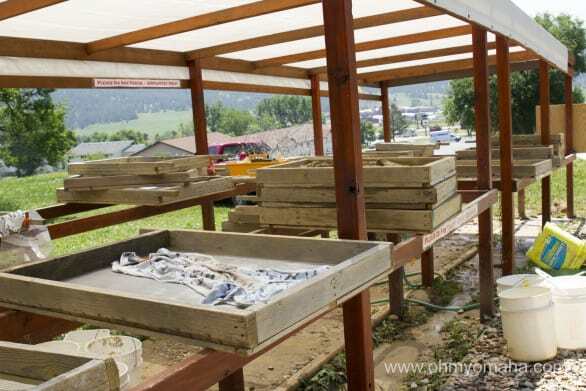 I think one of the best options for families with little kids is to register them in one of the kids activities offered there – in the summer, there are two types of junior paleontologist classes, which sound like the perfect hands-on learning my kids would like; unfortunately, it didn’t fit with our travel schedule. There’s also an Atlatl Throwing Experience that sounded intriguing. Cost: Adults (13+), $10.14; seniors (60+), $8.29; kids (4-12), $7.37; kids 3 and younger, FREE. Summer classes are $10-$20.